Duke University Health System is a world-class hospital and health care network including three hospitals in central North Carolina (Duke University Hospital, Durham Regional Hospital, and Duke Raleigh Hospital), as well as outpatient, wellness, and hospice care. Physician engagement is an important aspect of Duke Health's mission. Previously Duke Health had worked with external vendors to deliver the Clinical Practice Today website and newsletter to physicians. Duke Health sought to centralize and streamline these efforts in a single Duke Health subsite, leveraging technology used for dukehealth.org. To maximize physician engagement with the new subsite, Duke Health conducted market research and determined that the physician audience wanted their own dedicated web portal and online tools for making patient referrals. Physicians wanted the control to search by different criteria, such as physician name, or by specialty rather than condition/procedure, which was not supported by the patient-oriented “Find a Doctor” search tool on dukehealth.org. In order to provide a tailored solution for referring physicians, one that was simple, fit their clinical workflow and encouraged repeat visits, DesignHammer and Duke Health began the project off with a robust discovery and planning process. This included competitive analysis of other prestigious health systems to determine best practices in content organization and navigation, card sorting to identify appropriate homepage content and navigation structure, and tree testing to validate the proposed navigation. DesignHammer created the new website in Drupal 7, Duke’s preferred website development platform. 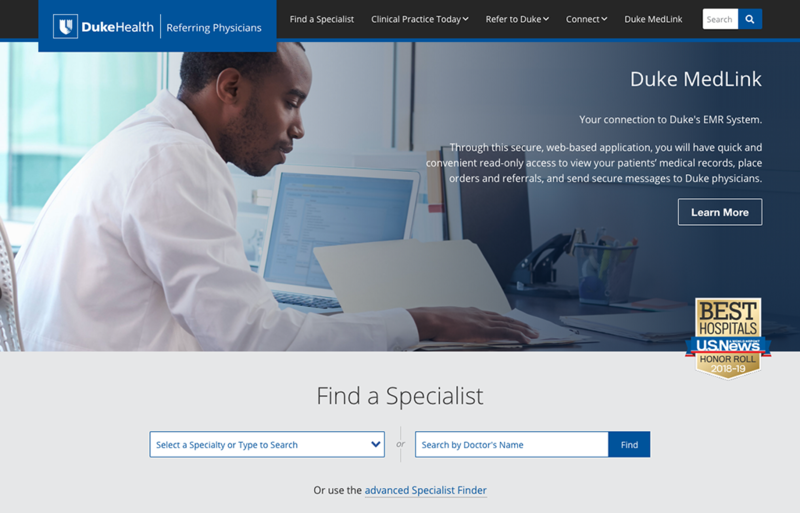 The website provides users with multiple search interfaces including a Mini Specialist Finder for the homepage, a full Specialist Finder, and a Search by Doctor’s Name–all to better connect referring physicians to Duke specialists. The system relies on Apache SOLR for search results. Specialist data, including Specialist Profiles, and auto-complete suggestions, utilizes the data provided for the patient facing “Find a Doctor” system to minimize staff overhead related to data maintenance. The administrative interface also provides content editors with similar functionality to dukehealth.org. To provide continuity and enhance SEO authority, the new website incorporated the previously standalone Clinical Practice Today website content (including appropriate redirection), adding landing pages for targeted specialties and CME (Continuing Medical Education) content. Clinical Practice Today delivers timely articles on Duke Health research, innovation, and other continuing medical education. To ensure access for all, the new website was developed in accordance with Duke’s latest standards for accessibility for users with disabilities. To this end, DesignHammer and Duke Health focused on delivering accessible navigation for all major site content. DesignHammer created a new platform for physician engagement that fit seamlessly into Duke Health’s internal workflow and facilitated physician referrals to Duke Health. The new Specialist Finder provides referring physicians with instant access to the latest specialist listings, with the added benefit of reducing Duke Health’s staff time by leveraging the same data source as the “Find a Doctor” search. Most importantly, the project delivered new ownership to Duke Health of the dissemination of Clinical Practice Today CME content, in parallel with Duke bringing the ownership of email marketing of CME in-house. This consolidation provided the Duke Health marketing team with full control of previously outsourced content. The previous North Carolina Alliance for Effective Care Transitions (NCACT) website architecture made it difficult for users to quickly find desired content. Most user interaction was primarily presented as links in the body content, making it very easy to overlook. It was also difficult to add new functionality related to gathering organization profiles and member sharing. DesignHammer migrated their existing content to a new WordPress website, vastly improved the navigation, and increased user interaction. With the ability to quickly add and customize new web-forms NCACT was able to get the information they needed from organization members. This also simplified the submission process. This allowed them to build a large database of healthcare organizations which benefits the users who need this information.